Please note: When purchasing on Amazon, make sure the edition you buy has the full title. Additionally, the hardback is available, but only by special request at this time. Please use the contact form to purchase. DORIAN TRENT is a young man with a head full of conflicting ideas. His mentor thinks Dorian will uncover the ultimate resolution between science and religion, but who will resolve his own confusion when it comes to Mildred and Carlia? 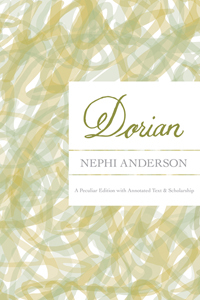 Dorian is the final work of Norwegian-American Mormon author Nephi Anderson, a mature masterpiece that has garnered favorable comparisons to the works of Jane Austen, Thomas Hardy, D.H. Lawrence, and, Dorian’s favorite, Charles Dickens. This Peculiar Edition combines the original 1921 novel with excerpts from Anderson’s original typescript, fresh critical analysis of the novel, new notes on the text for the modern reader, and much more. Celebrate this valedictory accomplishment of one of America’s great lost novelists—and the grandfather of Mormon literature—by joining Dorian on his journey through philosophy, theology, romance, pain, struggle—and just the right amount of resolution. Shortlisted for the 2015 AML Award for Criticism. Whether returning to Anderson or meeting him for the first time, this Peculiar Edition is a journey into new levels of artistry and complexity—as well as a great yarn for a fireside read.